Sundays I usually try to laze around the house and not go out. So I had more time to cook. Had some friends over in the evening and hence decided to make soemthing special. The only non-veg item I had at home was shrimp and also had lots of pudina (mint). 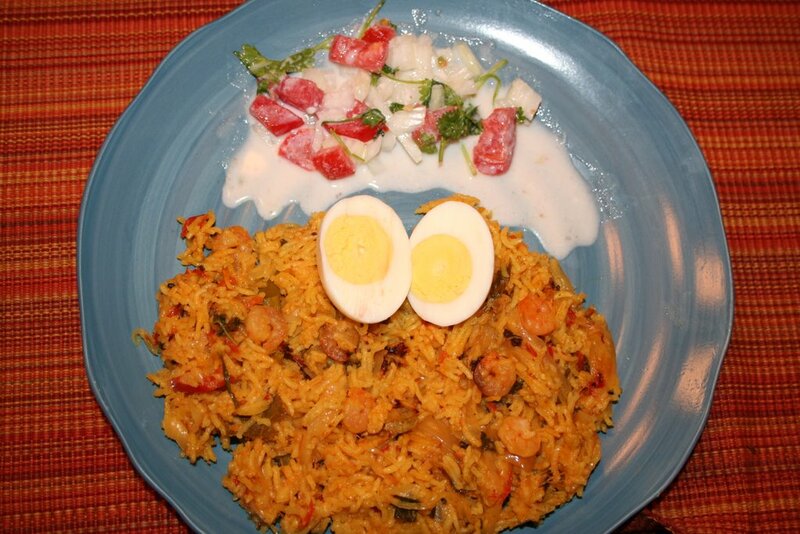 Hence I decided to make biriyani, onion raitha and boiled eggs for dinner. There are two methods that I use to make biriyani. The first method is fast and easy where I use the pressure cooker and cook everything at one go. The second method takes more time where I make the curry/masala and rice seperately and then bake them together (tastes more like traditional dhum biriyani). Yesterday I used the first method. Later I will try to post a detailed description of the second method. Wash and soak the rice in 1 cup water. Heat oil and ghee in a pressure cooker and add the spices. Add sliced onions and fry till they turn golden brown. Then add sliced chillies and chopped tomatoes. Once the tomatoes are cooked, add ginger garlic paste and chopped pudina and coriander leaves. Fry for 2min and add turmeric, salt, garam masala and biriyani masala. Fry for 5min and then add washed and cleaned shrimp. After 10min add rice, curd and lemon juice. Add 2.5 cups of water and close the lid and let it cook for 2 whistles. Serve with boiled egg and onion raitha. Vegetables can be added instead of the shrimp. Add all ingredients with half a cup of water and mix. Optional: Seasoning can be done with half tsp oil, 1 tsp mustard seeds and added to raitha at the end.